Hans der Storer is noted in Herbertingen in 1357. 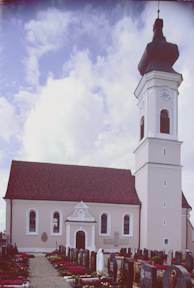 Kirchen had a Storer in 1641, nearby Zell in 1645, while Griesingen comes later. 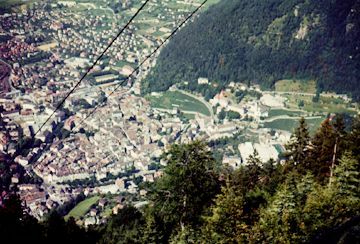 Ertingen, now a major center of Storrers and earlier of Storers, comprises with these other four towns Danube-related Storre settlements. Ertingen is above the right (eastern) bank of the Danube. 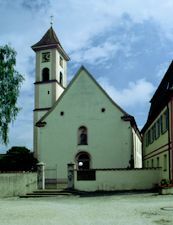 Villingen is about 75 km nearly due west of Ertingen, and is on the Brigach river, a tributary of the Danube into which it flows 15 km south at Danaueschingen. It is these two towns, Villlingen and Ertingen, from which we suspect the first Storrers came to Siblingen, but we do not yet know which. 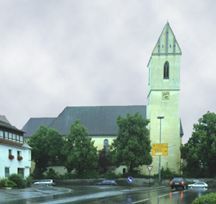 Southeast of Ertingen on the Oberschwabische Barockstraßr (Upper Swabian Baroque road) are towns where more recently Storrers have lived or now live. 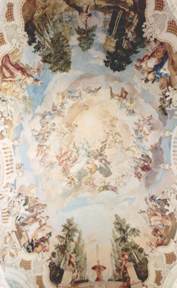 I show in particular Bad Schussenreid and the ceiling of one of the great Baroque churches, in Steinhaussen. The entire contents of this web site including genealogical information is copyright © MMV William Allin Storrer. While Villlingen is about 50 km from Siblingen (as the eagle flies) and Ertingen about 85, the overland route from Villingen is nearly 80 km and that from Ertingen may be only about 10 km more. At least that is what I can derive from what is likely to have been available roadways in the 14 hundreds which is when the first Storrer apparently moved to Siblingen. 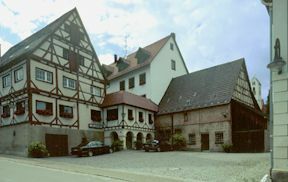 Since all the Storrers we've traced in the United States came from Siblingen, the interest in which of these towns is the source is high. To view the Ertingen graveyard and Ertingen Storrer/Storer family documents, click HERE. 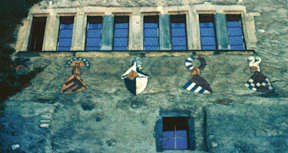 Further, Konstanz/Constance on the Bodensee/Lake Constance is where we find the earliest form of the Storre coat of arms. Here a Catholic bishop; Franc. Carol. Storer (S.S.Theol. & Vice General, Konstanz, birth date unknown, died 28 Nov 1730) used that crest, which is on the wall of the ambulatory on the north side of the Catholic cathedral. Lucas (named Bartholomäus) Storer is mentioned in the Bürgerbuch of Konstanz 9 June 1612. His dates are 1580 - 1614. He was a professional painter. He had one son, Johann Georg Storer. Johann Christof Storer 1611 (1620?) 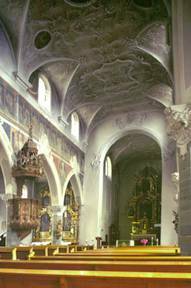 - 1671 was a painter within the Catholic Baroque tradition. 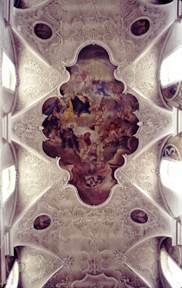 Some of his work is in the Munster Konstanz (Leinwandbilder 1659). 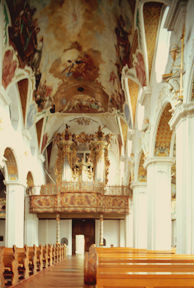 He also made drawings to the statues of Peter and Paul at the High Alter and the epitaph Weihbischof Müller, Westwand. He is buried in the Schottengottesacker. He lived in Milan 1644-1652 and 1653?-1657. 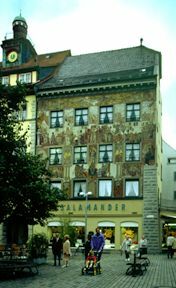 It is not known why he returned to Konstanz. His second wife, Angela Pamphorn, and Italian, died in 1685. 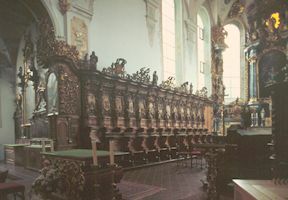 He had three sons and a daughter; John Lucas (painter; went to Milan in 1644 with his father, died there in 1675), Franz Karl (died 1730, Dr. of theology and Domherr), third son name unknown but was a licensed jurist, and a daughter, name unknown, who lived in the Zoffinger kloster. 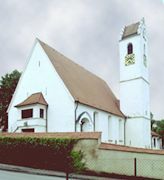 Then, further up the Rhine is Chur, the original north-Alpine terminal of the north-south central European commercial highway, with the oldest church north of the Alps. Storers settled here in the early 1500s, perhaps earlier though no record of earlier settlement survives. 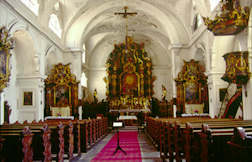 There are no baptism records for the St Martin church between 1596 and 1610. Thus we do not know if the next record of our family in Chur is a son of Simon or another person. In the 1960s there were still Storers in and around Chur, but by the 1990s there are none listed in the phone books, only Storrers.